All Natural Pond Treatment by the Scott Aerator Company promotes and maintains clean, clear water in large ponds and lakes. It helps eliminate muck as it simultaneously reduces nitrates, phosphates, and odors. All Natural Pond Treatment contains a blend of five beneficial pond bacteria and pulverized barley straw powder to naturally eliminate murky water and bottom-sludge (muck). It also contains multiple species of cold-water bacteria that can perform in water temperatures as low as 35° F, making it a true all-season formula. This treatment is formulated with 100% natural ingredients and contains no harsh chemicals. Packaged in convenient, pre-measured, 8-ounce, water-soluble packets, it eliminates the hassles of applying loose powders. Simply throw the desired number of packets directly into your pond. They dissolve within minutes and are totally safe for swimmers, pets and fish. Recommended dose rate: 5 pounds (10 packets) per surface acre of water every 2 to 4 weeks, depending on pond condition. Packaged in 25-pound pails containing 50 packets each. Proudly made in the USA! The Aquatic Weed Eradicator is a great cutting rake for lake and pond weeds. Its 28-inch, serrated cutting blade and 11-foot pole easily reach and slice weeds at the pond bottom. The rust-proof blade is reinforced to handle heavy loads of cut weed, so you don't have to worry about it bending under a heavy load of weeds. Its two-piece, powder-coated aluminum handle with new pushpin splice design assembles and dissembles easily. A 66-inch pole extension is also available. Get to the root of your lake or pond weed problem. Keep your lake bottom weed-free and harvest your cut weeds. Keep your beach front free of weeds and debris. Remove decaying organic matter from your lake and pond bottom. Clean your beach, root up weeds and remove muck. 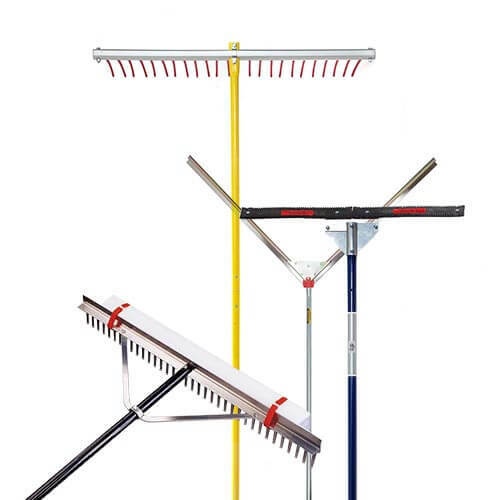 The Weed Raker has an 11-foot handle, the Raker head is 37" wide, the tines are 8" long, and 43 feet of floating rope is included. Overall weight is 7 pounds. Its hollow rake head can be weighted down with rocks to dig deep in the lake bottom. Its super-size rake collects large mats of floating debris. The Weed Razer is the one of the most cost-effective, efficient, environmentally friendly tools available for cutting aquatic weeds like milfoil, hydrilla, cattails, and lily pads. The Weed Razer's unique design lets you throw it from dock, shore or boat; watch it sink to the bottom; cut a 49-inch-wide path; and retrieve it with its 25-foot rope. The Weed Razer features a 49-inch blade width, and includes a 9-foot handle and 25-foot rope, plus a hand sharpener to keep the razor blade edges sharp and ready. Retrieve with short, jerking actions. Weighing less than 8 pounds, the Weed Razer is light enough to toss 30 feet or more, yet heavy enough to sink to the bottom. Because the Weed Razer slices weeds at their base, there's no need to drag or tear the weeds as ordinary weed cutters do. The Beachroller is an amazingly simple tool that eliminates lake weeds at the roots. It's the only manual lake weed-cutting device that gets to the problem: the lake bottom. The Beachroller cuts and pulls weeds out by the roots while simultaneously loosening muck and silt on the bottom. The 2-foot-wide roller is equipped with six custom blades connected to the 15-foot handle, so you can cover a large area in a short amount of time. Cut weeds don't stick to the roller, so there's no need to stop and clean off nasty stuff. Put the roller in the water. Let the roller fill with water and sink to the lake bottom. Push the Beachroller along the lake bottom. Six custom blades cut, rip and pull up weeds and muck. Repeat until your beach area is clean.